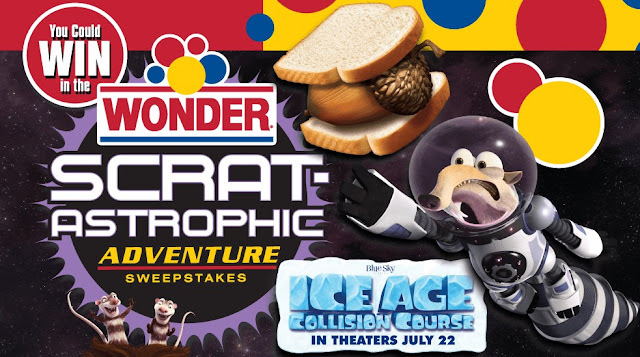 Wonder Bread and Twentieth Century Fox are celebrating the release of Ice Age Collision Course by giving you a chance to enter once to win the ultimate family adventure for you and the kids! Runner up winners will get American Express gift cards worth $50 to get a ton of yummy Wonder Bread! Grand Prize: A trip for winner and 3 guests to Los Angeles, CA. Prize consists of round trip coach air transportation for winner and 3 guests from the major commercial airport closest to winner’s residence; use of a rental car (winner or winner’s guest(s) must be eligible and comply with rental company’s terms and conditions or this portion of the prize will be forfeited); 3 nights’ standard accommodations (one “family room” for 4 people); a “Tandem Scrat Jet Pack Experience” of 10 minutes per person (must be a minimum age of 5 years old for this portion of the prize); entry to the Griffith Observatory Planetarium; and four “Nutty Ice Cream Sundaes” to be awarded as a pre-paid gift card at an ice cream shop to be determined by Sponsor. Total combined approximate retail value of prize, which is based on 2 adults and 2 children under the age of 12, is $4,950. (20) First Prizes: a $50 grocery gift card, to be awarded as an American Express prepaid gift card. Approximate retail value $50 each.